The United States Bowling Congress held it’s annual Convention and Annual Meeting April 22-25 in Reno, Nev.
One of the major topics of interest to all bowlers are the proposals to be voted on.There were 825 voting delegates (794 association delegates, eight athletes and 23 board members) voted on six proposals relating to USBC bylaws (two were withdrawn), one proposal relating to league rules, and one proposal related to tournament rules during the legislative session. USBC bylaws proposals required a two-thirds vote to pass while league rules and tournament rules required a majority vote. Five proposals (one league rule, one tournament league rule and three USBC bylaws) were accepted and three proposals (USBC bylaws) were rejected. Allows notice and a copy of the complaint to be sent via email. This change basically allows one more form of communication, email is commonly used for this type of communication across all types of organizations and industries. a. Within one week after receipt of the written complaint, the league president should schedule a meeting of the league board of directors, and members of the board shall be notified. The meeting should be held at the earliest possible date. b. Written notice and a copy of the complaint shall be provided to the individual(s) charged. 1) Should be sent by first class mail, hand delivered, or emailed. 2) Shall notify the individual of the date, time and place of the meeting, as well as his/her right to attend and offer a defense. c. A roster shall be prepared listing those present and absent. A quorum of the board of directors must be present at the meeting. Minutes of the meeting and all documents and material relating to the charges must be maintained. d. A two-thirds vote of board members present and voting shall be required for dismissal and/or removal from office. Removes the maximum restriction on local dues and allows for the local Board of Directors to determine the dues. Amendment to B1 requires an approval by Association membership, by vote, at the annual Open Membership meeting to approve or reject a local dues increase. 3.Conducting championship level competition for its membership constituency (men, women and youth) and complying with state and local laws in their area. 4.Implementing USBC programs as requested. 7.Approving use of membership records. 8.Re-rating the league average of an association member when there is evidence the bowler’s average does not represent the bowler’s true ability. 9.Conducting suspension and reinstatement hearings if requested by USBC Headquarters. Changes state dues maximum from $1 to $5. This allows State Associations to increase the membership fee from One (1) Dollar to maximum of Five (5) Dollars. B 1 – With the recent elimination of USBC awards and local Associations stepping forward to fill the gap of awards programs this makes sense, associations need financial resources to develop an awards program, this is an expensive venture even for the largest of Associations. The amendment to B1 requiring membership approval give a check and balance to the requested fees increase. B 4 – As with local association state associations are also feeling the effects of the economy, common sense should be the key to any fee increases with an explanation of why and how the new funds will be used. This entry was posted in VPUSBC NEWS on April 26, 2014 by Virginia Peninsula USBC. Billy Doyle, stationed in Norfolk as a member of the U.S. Navy pulled off a lifetime achievement by pulling a hat trick in the handicap division taking 1st place in singles, doubles and all-events in the VPUSBC Open Championship Tournament held at LANGLEY LANES Langley Air Force Base . And to put an exclamation point on his weekend he rolled his first 700 scratch series ,714, with games of 245, 210 and 259. 1st place was William C. Doyle with games of 245, 210 and 259 for a scratch series of 714 and 840 with handicap. followed by Richard C. Norris (832) in second and third place Kirk M. Crippen (793). In 1st place with 1532 total was Angel L. Casado and William C. Doyle. 2nd place was the double team of S. Berringer and J. Owens (1475) , 3rd R. Norris and M. Slaughter. In 1st place with a total pin count of 2790 Joni Austin, Mary Tabor-Mccabe, Larnell Austin and Stephen Edmonds and following in second one pin behind them the team of William Fieldman, Donald Stokes, Roy Brent and RobertSteele with 2789, and in 3rd with 2770 total Mel Melendez, Jamie L. Harms, Sachi Melendez and Teresa A. Davis. Mr. William C. Doyle placing 1st in All Events Handicap, Mr Doyle had an excellent tournament with series of 714 (S), 673 (D) and 624 (T) for a sct total of 2011 and 2389 with handicap. Richard Norris, 2nd place with total pin-fall of 2336, with series of 634 (S), 534 (D) and 574 (T). Michael Zeigler 3rd place with a total pin fall of 2257 for the tournament with series of 618 (S), 615 (D) and 610 (T). Michael Butts finished in 1st place with a total score of 2068 with series of 643 (S), 653 (D) and 772 (T). 2nd place with a total pin-fall of 1997 was Joseph Corbett series of 698 (S), 609 (D) and 690 (T). Close behind in 3rd with 1992 was Terrance White 726 (S), 643 (D) and 623 (T). In the Scratch Doubles there was a hotly contested event also with just 16 pins difference between 1st and 3rd pace with B. Sprouse/J. Corbett coming out on top with 1296 , D. Gouveia/S. Nunez 2nd with 1292 and J. Denney/K. Borowski taking 3rd with a total pin-fall of 1282. In 1st place in the Team Scratch division team 245 Years Old with Kevin Morris, Barry Sprouse, Sr, Joseph Corbett and Terry Earnhardt with a total of 2599. 2nd place was the team of Thomas W. West, Roger J. Dorko, Corey S. Schultz and Ronnie W. Pack 2558 and in 3rd place was Dennis F. Vancamp, Daniel K. Hilling,David C. Brownell and Dennis C. Cooper with a total pin fall of 1475. We look forward to 2015 and we hope to see more of our VPUSBC Bowlers participating in the tournaments. 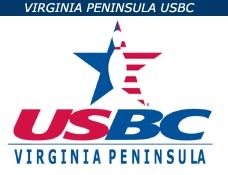 This entry was posted in Tournaments on April 16, 2014 by Virginia Peninsula USBC.